At least 48 people have been killed and 10 others injured after a TransAsia Airways plane made an emergency landing due to a typhoon in Taiwan’s Penghu county, a Taiwanese news agency reported. The TransAsia Airways GE222 flight was en route from Kaohsiung Siaogang Airport to Penghu’s Magong Airport. Taiwanese transportation authorities said the plane was forced to make an emergency landing in Penghu County’s Huxi township, the main island of the chain also known as the Pescadores. Transportation Minister Yeh Kuang-shih said there were 58 people - 54 passengers and four crew members - on board the plane.Two of the people killed were French and identified as Jeromine Deramond and Penelope Luternauer, the state agency said. The plane caught fire “at the end of the runway” and ten people sustained injuries, Taiwan's Central News Agency (CNA) reported. Local media say that the pilot was experiencing difficulties landing the plane in Penghu due to a typhoon, which was ravaging the area. “It was thunderstorm conditions during the crash,” said Hsi Wen-guang, a spokesman for the Penghu County Government Fire Bureau, as quoted by Reuters. "From the crash site we sent 11 people to hospital with injuries. A few empty apartment buildings adjacent to the runway caught fire, but no one was inside at the time and the fire was extinguished," he said. One of the plane's flight data recorders was recovered, Taiwan's transportation minister said at a news conference, adding that investigators are to examine the crash site on Thursday. Flight GE 222 was scheduled to take off from Kaohsiung at 4 pm for Magong, but the departure was delayed until 5:42 pm because of the typhoon. Flight GE 222 requested a go-around while trying to land at Magong Airport in difficult weather conditions and then lost contact with the control tower when it was about 300 feet above the ground, according to Taiwan’s Central News Agency. The plane was caught in Typhoon Matmo, which hit Taiwan on Wednesday, closing schools and businesses. The typhoon has now headed into China and has been downgraded to a tropical storm. TransAsia Airways mainly flies domestic routes with some flights to Japan, Thailand and Cambodia and has a fleet of mostly Airbus aircraft. 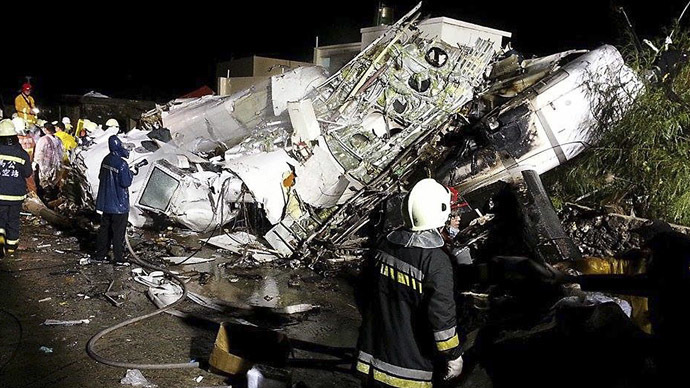 The ATR 72, which took off from Kaohsiung in southern Taiwan was 14 years old, according to CNA. The ATR 72 is a French-Italian built turbo prop and can carry up to 74 passengers.